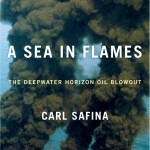 Carl Safina, A SEA IN FLAMES: The Deepwater Horizon Oil Blowout. When the news broke the first week of April that Transocean executives received a bonus for exemplary safety, you might have thought it was an April Fool joke. But then we heard that deepwater oil drilling has begun again in the Gulf. And BP has just requested a permit to resume drilling there. Meanwhile, the fishing and tourist industries have still not recovered. Dolphins are dying in droves and fish are turning up with diseased fins. The true toll of the Deepwater Horizon disaster won’t be known for many years. And many questions remain about who is at fault, questions that will be hashed out in the courts for years to come. 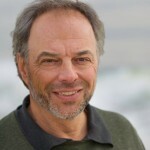 But just in time for the anniversary of the Deepwater Horizon disaster, marine ecologist and writer Carl Safina has come out with a book that tells its story in writing that crackles with energy and passion. He calls it an “emotional topography of the blowout.” But it is driven by more than emotion. Safina meticulously deconstructs what caused the blowout and the technological, biological and emotional responses to it during the time the oil was flowing. Then, he pauses for reflection to ask who and what is to blame, not just for the blowout but the many failures of the response. And finally, he talks about the effects of the blowout on fish in the gulf — and comes up with some surprising answers.